The Hidden Bench Estate Pinot Noir 2013 is a handcrafted, organic bio-wine which shows dark fruit, earthiness and typical Bench minerality on the nose. 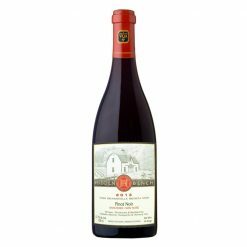 The palate is rich and dense with dark berry and a sweet ripe cherry fruit core. Tannins are supple and finish long and lingering. The fruit for our Estate Pinot Noir comes from select parcels in all three of our Estate Vineyards. At ruit set, we exposed all bunches to sulight, with leaf removal on both sides of the canopy to maximize ripening. Green harvest was performed at the first sign of veraison. Yields in 2013 were healthy and on average the Estate Pinot Noir produced 36.4 hL per hectare (2.08 tonnes/acre). The grapes were hand picked, sorted and cold-soaked in small lots for 5 days. Fermentation started naturally with indigenous yeasts and the caps were gently habd-plunged between three and four times daily during fermentation. At the end of fermentation, the free run juice was drained by gravity directly into barrels and the skins were gently pressed in a traditional basket press. Natural malolactic fermentation was complete in the Spring of 2014. Owner Harald Thiel’s uncompromising attention to detail has landed Hidden Bench in the Canadian Wine Awards’ top 10 every year since the winery opened in 2007 – with Nuit Blanche named Canadian White Wine of the Year. 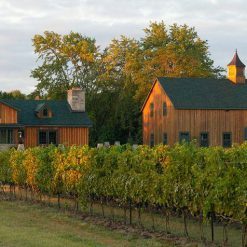 This small, yet modern and sophisticated, estate winery is tucked away on Locust Lane in the Beamsville Bench appellation, essentially hidden by vines. 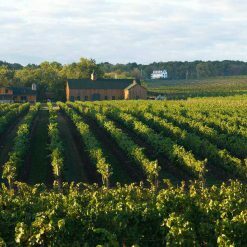 HB’s primary focus is to showcase the terroir of the Beamsville Bench through their award-winning Pinot Noir, Chardonnay and Riesling offerings. Limited-edition rarities like Tête de Cuvée Chardonnay are made in special vintages as well. 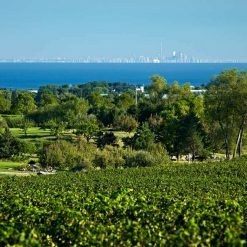 Our mission is produce internationally recognized, superior wines made exclusively with estate grown fruit from the Beamsville Bench VQA sub-appellation that are reflective of this unique terroir. The quality of our wine will be a product of our passion for uncompromising excellence and attention to detail, and will inspire us to continue, and our clients to value and to seek out our wines. We will achieve our mission and vision by working together in a spirit of teamwork and mutual respect in accordance with our core values and above all while enjoying what we do and having a lot of fun, creating and sharing our wine. We believe that the Beamsville Bench’s unique terroir and our sustainable viticulture practices, coupled with our low-yield crop management will provide Hidden Bench with the best fruit, producing wines of pronounced character complexity and bearing a sense of place and time. We believe that we can enhance the winemaking and viticulture process by the selective application of the latest technology in the vineyard and the winery while respecting the traditional non-interventional winemaking style and sustainability that we embrace. We are only stewards of the land and, as such, we will apply sustainable best practices in the vineyard and the winery to reduce the impact of our footprint on the environment, our neighbours, and society as a whole. We will use environmentally sound practices and products wherever possible in the making and marketing of our wines and all the while protecting the resources and infrastructure of Hidden Bench. An ongoing passion for excellence and a contagious enthusiasm will be the cornerstones of the approach we embrace to achieve our mission and vision. Our ongoing uncompromising applied attention to detail will help distinguish and differentiate our wines and our winery from our contemporaries.